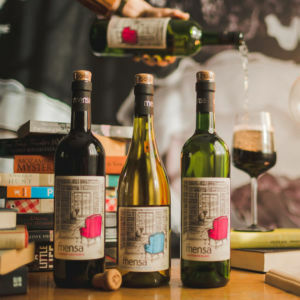 Mensa, a novel wine range taking storytelling through digital innovation to the next level, has just been launched by Overhex Wines International. Storytelling and books resonate strongly in this new wine range and are captured perfectly by the payoff line: Live a great story. The label features ‘everywoman’ relaxing in the signature Mensa chair surrounded by books with a glass of wine and her trusty dog looking on. If you love a good story and believe that life is an adventure made better by good wine – Mensa wines are tailor made for you. Mensa offers wine lovers yet another unexpected twist. The wines are sealed with the revolutionary Helix cork closure by Amorim that allows you to twist open and reseal the wine by hand, keeping it perfect for the next glass. Just pull – twist – pour and your Mensa wine is ready to drink. Now you can enjoy all the benefits of cork and glass – quality and sustainability coupled with user-friendly, resealable convenience. Mensa is the ultimate book club wine. You will love the thought provoking stories imbedded in the Mensa range, from the intriguing name to the astute packaging, innovative AR app and easy twist closure. It is all designed to inspire you to live your own great story. The new Mensa range comprises three beautifully crafted wines for everyday enjoyment: a refreshing Sauvignon Blanc with citrus and tropical notes, a delicious Chardonnay Pinot Noir of citrus and red berry character, and a full-bodied Cabernet Sauvignon teeming with dark chocolate and blackberries.